The Cub House bike shop has been open for just over a year and it has quickly become a mecca for both bike geeks and freaks from all over SoCal. On any given day hyper-expensive Euro road bikes can be found nestled next to ratty fixed-gear bikes while skinny-legged roadies listen to the bizarre stories told by some vaping skate rats. Having a place to hang-out where camaraderie and co-existence are the guiding principles are the key elements that make it all work. 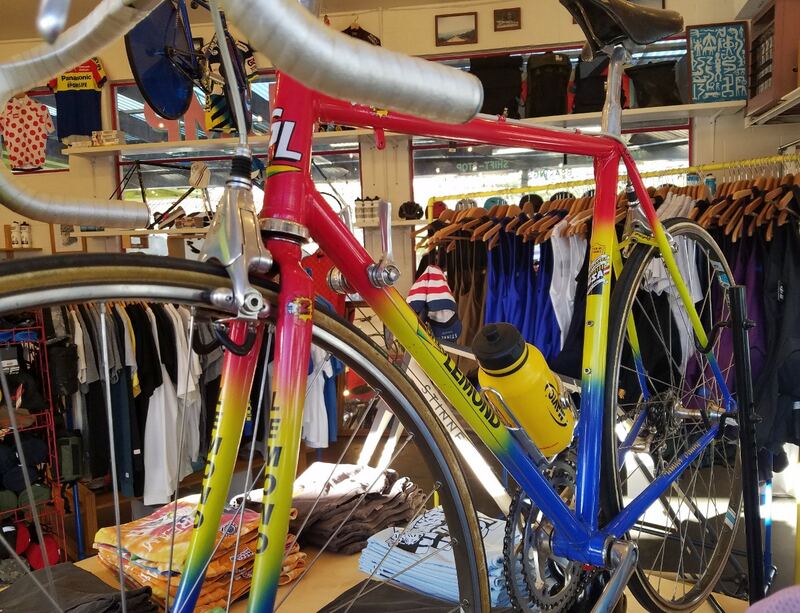 That this funky menagerie of bikes, plants and lawn furniture exists in one of the toniest sections of South Pasadena, makes the shop’s existence even more unlikely. The following is a photo gallery of the Cub House aided and abetted by some of the words that will be found in the feature story I wrote about the shop and its owner, Sean Talkington (above), which will be found in the April issue of Road Bike Action. A funky bike shop in a fancy town that looks like it was once a nursery or even a gas station…oh yeah, it once was. Blue with envy over these classic steel frames from Serotta and DeRosa. Inside the Cub House shop you’ll find a veritable menagerie of old and new cycling clothing and accessories. On any given day there are strange bikes of every make and model found scatted about the property. The famous Cinelli Alter stem that was once made famous when bolted on Mario Cipollini’s Cannondale. Rare examples (with the pin-up girl top badge can still be found). Although there is no real “team”, there is no shortage of official “team” gear to be had. A special Masi chainring found appropriately enough on an old Masi. In addition to the bike swaps, Sean has also used a car show to help draw traffic to the shop. How sweet is this rare & immaculate VW pick-up truck with Porsche wheels and a sweet Torker BMX bike? There’s nothing like finding a super rare Teledyne titanium frame in a stack of used frames for sale. This is Simon. Simon is the man. Why? Because Simon what says about building bikes is the rule. People travel from miles around to have Simon lay his hands on their bikes. A good mechanic is key for any bike shop to survive the internet onslaught.